Quick explanation: This is going to be a title for a kind of series that I plan to make from a blog posts about my struggles, mistakes, obstacles, errors and problems that’ve encountered during development time. It’s going to be a log of a WP8 and WP greenhorn programmer trying to make his way through a maze of new stuff. Don’t expect some fireworks, it’ll be rhather kind of compendium of what to do when you stumble upon a particular problem. I hope it will help others like me to avoid same mistakes, ease the pain of searching over the internet for a solution to their issue, make their life easier or just learn with me. Let’s get started! 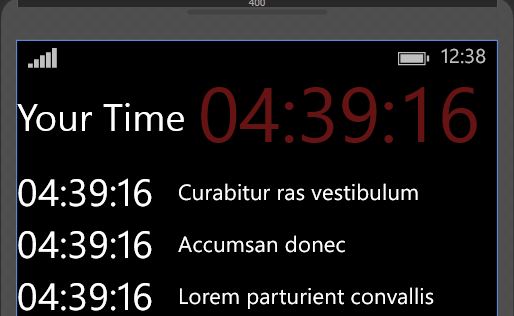 This project, about which I’ve mentioned in my previous blog post, is a simple idea of showing on the screen, of your device with Windows 8.1 or cell phone with Windows Phone 8.1 on it, current time in different times zones. 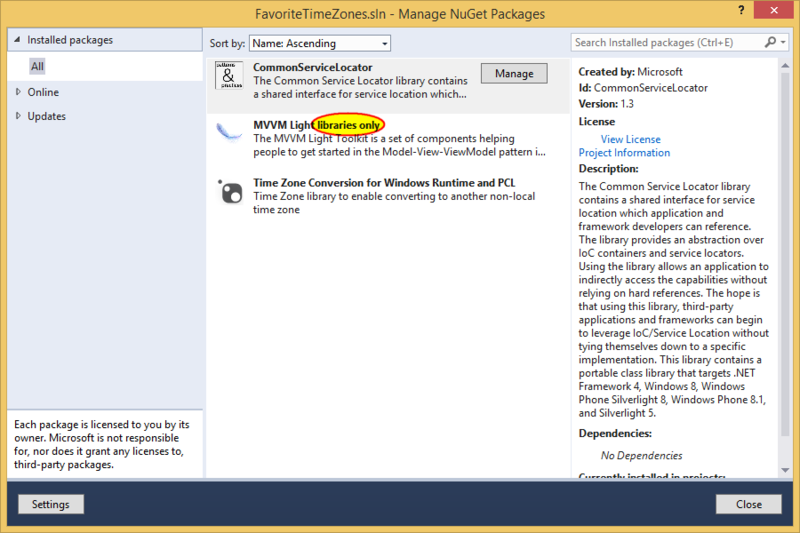 After starting new Universal App project from Visual Studio with at least Update 2 on board I’ve added MVVM Light Librariesand Time Zone Conversion for Windows Runtime and PCL with NuGet pakcage manager. MVVM wasn’t necessary because of the pragmatic point of view you don’t have to apply MVVM concept to such simple application. The reason behind me adding MVVM Light to this project is simple, I want to do things right, following good practicies. 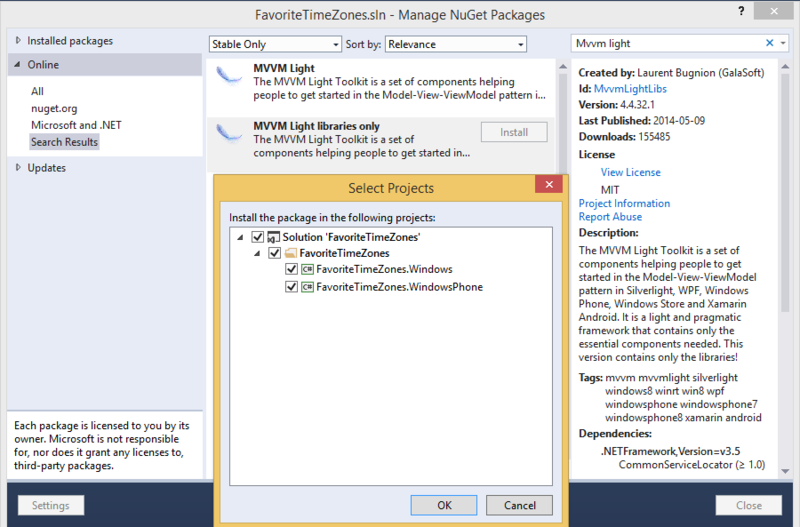 After that my NuGet packages manager looked like on the screenshot below. CommonServiceLocator is atomatically added with MVVM Light. At the top, there will be displayed users current time and underneath it there will be a list with favorite time zones. After a little bit of design of the page, I put a lot of emphasis on little, we can start playing with some logic around it. First thing we do, is to get the user time clock to work. Usually you would create a Clock.cs class and imitate time lapsing with System.Threading, inifinite loop and Thread.Sleep(). Maybe it’s not the best way to create clock when you have to be really precise, but for our purposes it’s enough. To start new Thread you could do something like, right ? private const uint MIN_CLOCK_TICK_INTERVAL = 100; // 100 ms. It has a ctor() that takes tick interval and has one public method, Start(). Although, the most important part is the Tick event handler that we will register to and we will update our clock once the event is invoked. ClockStart() method is an endless loop, called from ClockStart() in a separete Thread (Task), that ‘Ticks’ every specified interval time. In our case it’s going to be 1 sec. Let’s then start our clock and register to its tick event. _clock = new Clock(1000); // 1000 ms = 1 sec. This is our ViewModel class for MainPage. It inherits from ViewModelBase (MvvmLight). It provides implementation for INotifyPropertyChanged interface and gives us easy way of communicating to the View that some changes in the ViewModel have been made. This notification mechanism is done with RaisePropertyChanged method. In the ctor() we are creating a Clock (not the best place for it, but this is done only for the example purposes) and registering EventHandler for the Tick event and then we Start() the clock. Everything looks great. Clock is working, Tick event is fired and ‘captured’ so we could refresh View and its done with RaisePropertyChanged. Should work, right ? This is what you’ll get. Exception, telling you that some thread wanted to access area that he wasn’t allowed to enter. This is rhater obvious when you think about it. I’ll relate this situation to a real life one. Let’s say you are driving a car and next to you sits a passanger. You’re on a long and boring drive (Main Thread), straight road for hundreds of kilomiters, and all of a sudden, you don’t know why, your passanger is trying to grab the wheel and turn the car (different Thread). So what do you do ? Of course you are going to slap his hand(s) and ‘revoke’ his try to kill you and himself. This rule applies even when it comes to a radio station, slap ;] ! What in a situation if passanger had a really good reason to try to interrupt you ? Like, we are going to miss a turn or they started to play Justin B. on the radio. So the passanger could succeed with his intentions and actions, he is obligated to say to a driver ‘listen, you should take next turn left’ or in our case ‘listen, there is something that you should update on your view’ and then the driver, who has proper permisions, will respond with an action. This is done through a DispatcherHelper and CheckBeginInvokOnUI() method in MvvmLight library.